The Sandman, a figure of myth and folklore, preys on the young and old alike. He lurks in the shadows and it is death to look upon him. All too soon after the TARDIS arrives, it is evident that the Doctor and the Galyari share a dark history, and Evelyn is shocked to discover that, on the Clutch, it is her friend who is the monster. One of my favorite episodes of Doctor Who is the Tenth Doctor two-parter Human Nature/Family of Blood. The Doctor hides out on Earth in pre-Great War England, taking on a human disguise to avoid being detected by the Family, a quartet of aliens who are determined to feast on his time energy in order to sustain themselves. In the end, the Doctor’s true identity is revealed, and Son of Mine gives us a very chilling line. That was the worst thing— the fury of the Time Lord. And then we discovered why — why this Doctor, who had fought with gods and demons, why he had run away from us and hidden. He was being kind. The Doctor: I’m so old now. I used to have such mercy. Voice of House: Fear me, I’ve killed hundreds of Time Lords. The Doctor is wise and wonderful, but he also is terrifying, with the potential for such anger and vengeance. The recent The Night of the Doctor, to me, is where all that repressed rage finally overcomes the Doctor’s very nature, forsaking his very name in order to fight in the Time War, and whatever actions he took in the Time War, they were enough to make the Daleks afraid of him and the Sontarans upset that they weren’t asked to fight alongside of him! The Sandman is a unique serial to look at in this light. Released in October 2002, well before concepts like the Time War and the War Doctor were a glimmer in the eye of Russell T Davies, the story had the potential to answer a very simple question – whatever would happen if the Doctor were to give into a darker nature and abandon his principles? It’s a very interesting concept to dive into, and in the right hands, Big Finish could have given us a serial for the ages that turned everything we knew about the Doctor in its ear. What the listener ends up with, however, is a serial that plays it incredibly safe and turns out to be nothing more than serviceable. The Clutch is a massive fleet moving through the darkness of space, spaceships moving and swirling together like a school of galactic fish. To Evelyn, it’s a marvel the likes of which she’s never see. To the Doctor, it’s the location of his next appointment, with the species who serve as the heart of the Clutch, the lizard-like Galyari. Hitching a ride into the Clutch with a pair of free-traders, the Galyari avert their eyes from the Doctor as he passes, going about his own business on his way to a meeting with Orchestrator Shol. Shol dreads this meeting, where the Doctor proceeds, much to Evelyn’s amazement, to bully the Orchestrator, lording over him as he demands the Galyari cease their weapons trade. The Orchestrator, however, has problems of his own. Galyari legend speaks of a monster known as the Sandman, who stalks the species and tears their skins clean from their bodies, and lately, corpses have been found across the Clutch having met that same fate. The Sandman, it turns out, is no myth. He’s very, very real. Colin Baker was considered the “darkest” of the Doctors during the classic run. His stories contained more violent content, including the serial Vengeance on Varos, which had “torture as entertainment” as one of its central themes. Baker himself played a more bombastic Doctor, but one whose thirst for justice and righteousness carried a severe risk of falling into the trap of “the ends justify the means.” The Sandman takes that concept to its logical conclusion, as the Galyari tell the legend of the Doctor to Evelyn. As the Galyari’s home planet fell to an alien invasion of burrowing creatures, the Doctor, or Sandman, ordered the surrender and retreat of the Galyari. And to back up his threat, he took the skins of fallen Galyari as trophies. When the Galyari counter-attacked, however, the Doctor, wearing a coat of their dead that prevented the Galyari from even looking at him, smashed the Srushkubr, or “memory egg,” that served as the heart of their planet’s civilization. From that day forward, the Doctor banished them from their homeworld, leaving them to travel the spaceways as a vast migrant fleet ala the Quarians from the Mass Effect series. And, in order to ensure the Galyari may never return home, the Doctor arrives from time to time to ensure they are no longer capable of defending themselves. 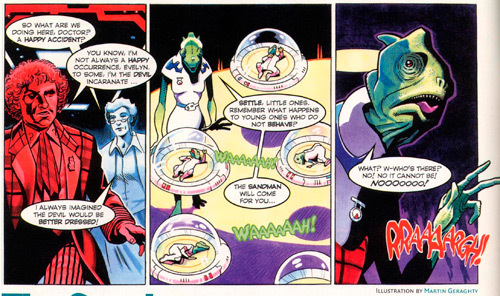 The story of the Sandman, as written by Simon Forward, requires both the Galyari’s side and the Doctor’s side to be told in order for the listener to fully understand what’s going on. The story itself is interesting, as the passage of millennia result in the truth becoming legend and legend becoming truth to the Galyari. The most important part of the story of the Sandman is that it makes sense. The Galyari don’t quite recall the way things happened, but that can be attributed to the passage of time, and the Doctor sees no reason to correct them. Why the Galyari are space travelers, and why they can’t go home again, and why the Doctor had a fistful of skins and his reasons for returning to the Clutch time and time again, it’s all very well written and put together. If The Sandman had been an audio about the fall of the Galyari planet and the Doctor’s role in it, instead of the legend being a driving plot point, it could have been for the pantheon. Now, if you’re going to have a “darker” Doctor who’s screaming about surrender and vengeance, all while holding a fistful of lizard skins, then you’re going to want…well, John Hurt probably. 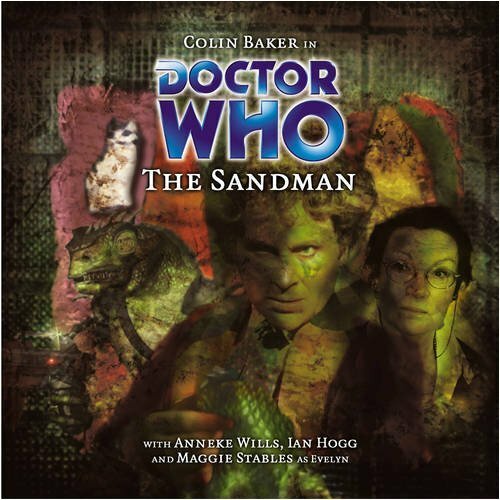 But Colin Baker does a splendid job in this serial as the Sandman. “To look upon me is Death!” he proclaims, and no one’s going to tell him any different. His acting as “The Sandman” is over-the-top, but when have we seen or heard the Doctor do over-the-top with such evil and terror in his heart? The Sixth Doctor has always had that potential for outright conflict, and a story like could have put the Valeyard, the Trial of the Time Lord, and the regeneration of the Eighth Doctor into the War Doctor in a whole new light. Baker manages to avoid going into hammy or outright mockery, further fortifying his position as the best audio Doctor. Outside of the Sandman story, Baker is also very solid as the Doctor, as he and Evelyn bluff their way onto the free trader’s ship and into the Clutch, and later on in the story, realizing just who or what the Sandman is. The Doctor is the best part of this story, and his role could have elevated it if not for the sum of the other parts. And there is a nice shout-out as to why the Galyari refuse to look at him that will make long-time watchers/listeners smile. While the sound and music are excellent (the background noises of the various rooms and markets of the Clutch are top-notch, and the battlefields of Galyari put the listener right there at the side of the Doctor, so once again props to the Big Finish sound guys and dolls), it’s the script that ends up being the downer. While it’s nice to see the Doctor not showing remorse or feeling sorry for his actions…no close-up on a brooding, pensive Doctor as Murray Gold’s “You Should Be Caring Right Now” theme plays…instead, it’s the Sixth Doctor going “I did it. And?”…the listener instinctively knows the Doctor ISN’T evil. The Doctor is not the type of man who skins his kills and threatens the existence of an entire race with genocide. The listener suspects the truth will come out, that the Doctor will reveal it all to be a misunderstanding, or a bluff, or some other grand scheme. So when the story of the Sandman is revealed, the listener doesn’t go “oh, that’s cool,” they go “eh, that makes sense.” But the script does its best to keep the idea that the Sandman and the Doctor are one and the same up for as long as possible, all the way to only revealing the true identity of the Sandman at the very climax, and again having it come off in a “oh, her/him/them/it” manner. It’s not far to Simon Forward, who’s penned several novels for Doctor Who, and the idea of the Doctor having a dark side to the extent that he acts upon those impulses is a risk that could have had a tremendous payoff. But the script and the story play it safe, leading us with a serial that’s just there. Next up – With Peri missing, Erimem catching King Louis’ eye and a Musketeer’s sword at your throat, could things get any worse?